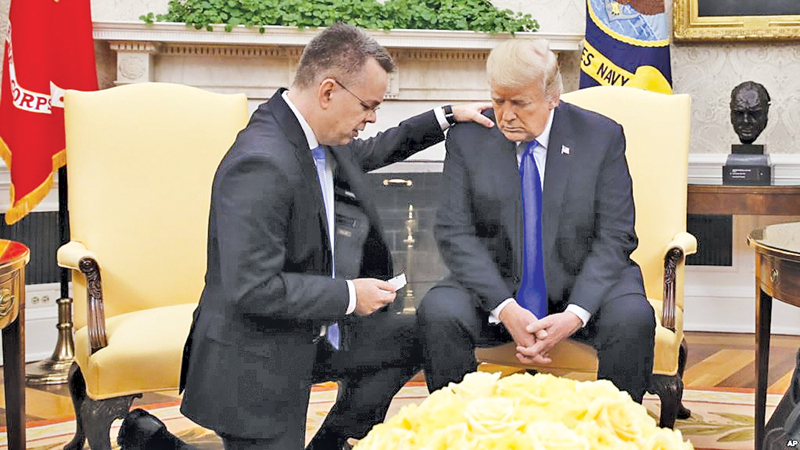 US: An American pastor held for two years in Turkey on terror-related charges arrived home in the United States on Saturday and sat down with US President Donald Trump, who signaled an easing in the diplomatic crisis sparked by the case. Andrew Brunson -- who has become a cause celebre for Trump’s conservative Christian base -- received a hero’s welcome at the White House shortly after his arrival at Joint Base Andrews outside Washington. Erdogan has said the court’s decision was “taken independently.” Both Trump and Erdogan have denied reports that the two sides reached a secret deal for the 50-year-old Brunson to be released in exchange for the US easing “economic pressure” on Ankara. But as he tweeted earlier, “There was, however, great appreciation on behalf of the United States, which will lead to good, perhaps great, relations between the United States & Turkey!” Erdogan later responded: “I hope that the United States and Turkey continue cooperation in a manner that befits two allies.” Trump continued to celebrate Brunson’s liberation into the night. “Big day! Pastor Andrew Brunson, who could have spent 35 years in a Turkish prison, was returned safely home to his family today,” he tweeted. He was first detained in October 2016 and faced up to 35 years in jail. Prosecutors then demanded a sentence of up to 10 years. The pastor steadfastly insisted he was not guilty. “I am an innocent man. I love Jesus. I love Turkey,” he said in his final defense. When the verdict was read out, Brunson wept and hugged his wife Norine. He said Washington would “continue to work hard to bring home all American hostages and those wrongfully imprisoned and detained.” NASA scientist Serkan Golge, a dual US-Turkish national, was jailed for seven and a half years in February on terror charges, a term reduced to five years last month.